Most lullaby books focus on the baby’s pleasure as its mother gazes into its eyes and sings a sleepy-time song. 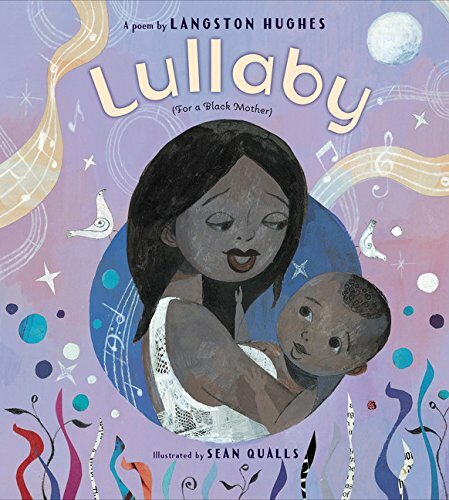 But in Lullaby (For a Black Mother), the late poet and novelist Langston Hughes focuses on one mother’s sweet pleasure as she wracks her brain for the perfect words to express her love for her child. The baby watches with adoring eyes as its mother speaks of making him a necklace of stars as he floats on the wind and points at the diamond moon. As she composes her original lullaby, both mother and baby imagine all sorts of beautiful scenes: Sitting on a night cloud in the evening sky; Mother blowing kisses that become sparkly stars as they reach the baby’s face; and finally, Mother lulling baby to sleep in a rocking chair in the clouds. This is a quiet and calming book with almost haunting overtones. Artist Sean Qualls’ illustrations have a vintage, almost Americana feel, and are all done in “bedtime” colors of purple, sunset orange, dark blue, and soft tan. They are, in short, a beauty to behold. The late Mr. Hughes’ text is brief to the point of being stark, yet the reader has no problem recognizing the keen love between mother and child. This curiosity is explained in a note at the end of the book, in which Mr. Hughes—an only child—endures long, lonely days with his grandmother while his mother works outside of the home. Lullaby (For a Black Mother) makes for a truly memorable multicultural lap book, a valuable addition to any library.